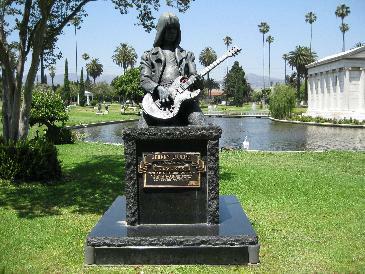 To anyone visiting Hollywood, I definitely recommend stopping by the Hollywood Forever Cemetery. 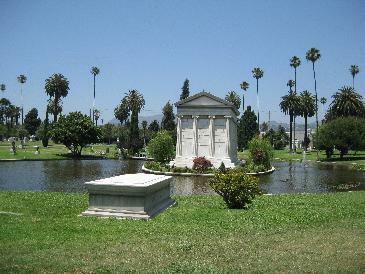 It is beautiful and is, of course, the final resting place of Henry B. Walthall as well as other entertainment stars of the past and not too distant past. 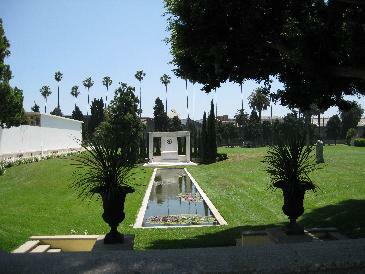 The cemetery is located at 6000 Santa Monica Blvd and, while I was there, you could drive right in and were free to explore the grounds and mausoleums. 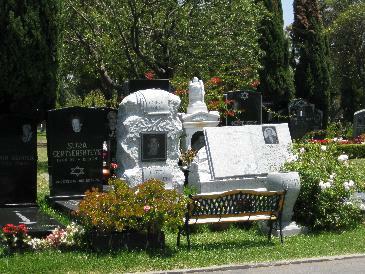 Some of the tombstones are astounding! I've never seen anything like them before. 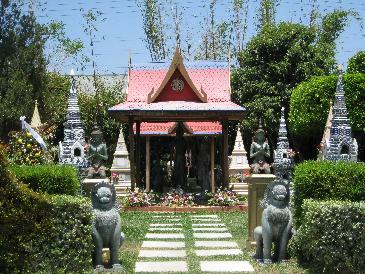 To the right of the entrance is a gift and flower shop. The white flower I bought for Walthall's crypt was only $2 plus the shop offered an official directory which includes a photo and brief bio of Walthall and the other famous residents of the cemetery. Maps of the famous gravesites are also available in the gift shop (high quality ones for $5) and the office (smaller, paper copies for free) located to the left of the entrance. 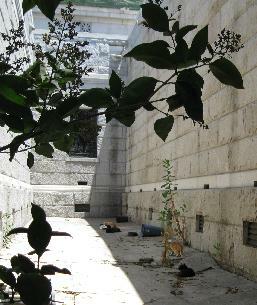 Stray cats living around the Cathedral Mausoleum. Henry's crypt is in the Abbey of the Psalms mausoleum in the Sanctuary of Hope wing. 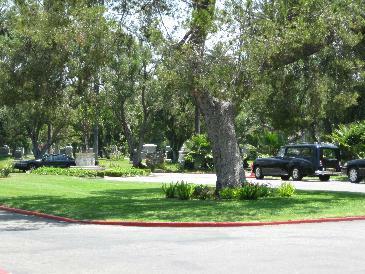 The mausoleum is on the right side as you drive through the entrance. In fact, we just by chance parked within sight of the Abbey of the Psalms and I recognized it immediately from photos I've seen on the Internet. 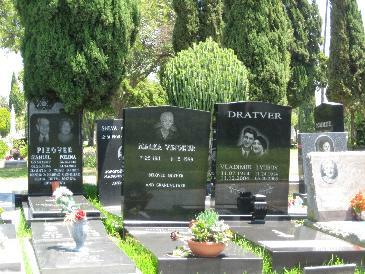 A caption on one of the photos on the Find A Grave site states that this wing had been closed to the public for years. I was very relieved to discover that this is no longer the case. The entire mausoleum is wide open. The names of the wings are not above the entrances, so you really need to search for them. 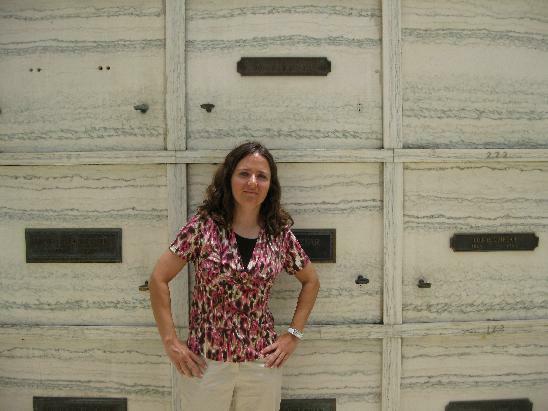 To find Walthall's crypt, walk through the front entrance of the mausoleum and enter the first wing on your right. There are a few steps going down into the wing. Walk to the end of the first section and you will see a niche in the wall on the right side with a wall hanging and "SANCTUARY OF HOPE" carved in the floor (Yes, this is the right place! ; actually, it looks like this may have been the original entrance). Keep walking down the next section and Henry's crypt will be on the right side #370 (I learned quickly touring the mausoleum that these numbers are repeated throughout, so you need to be in the correct wing). His crypt is on the third level which, to me, seems ideal. The #370 is above his crypt. I was disappointed that one of the flower holders on Walthall's crypt has been broken off. 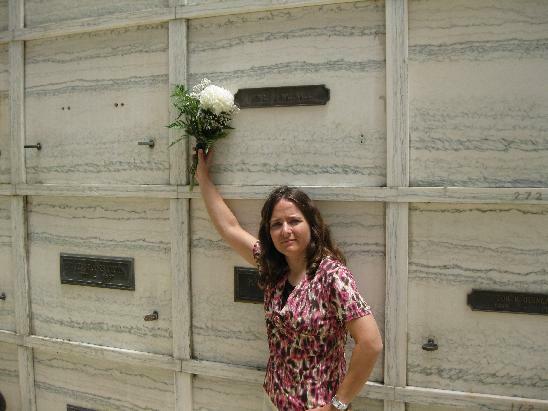 The holder is in the photo submitted to the Find A Grave site so I'm assuming it was broken just within the last few years. His name plate is as modest as it gets which is very appropriate for the humble actor. It is just his name in simple font with no dates, quotes, or film references. It is actually so lacking in ornamentation as to be difficult to photograph. It is not that easy to read even in the closeup at the top of this page. The location of the crypt has a loneliness about it. 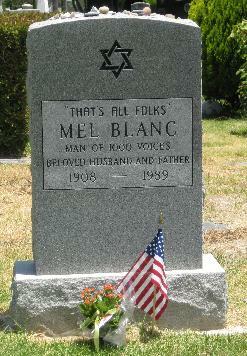 There appears to be no neighbor to his left and perhaps no one at his right unless the crypt is missing its nameplate. 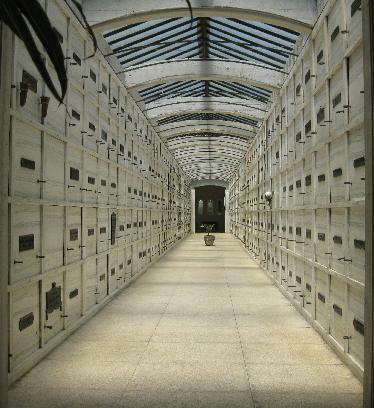 The crypt immediately above his and above to his right are empty although there are reserved tabs. 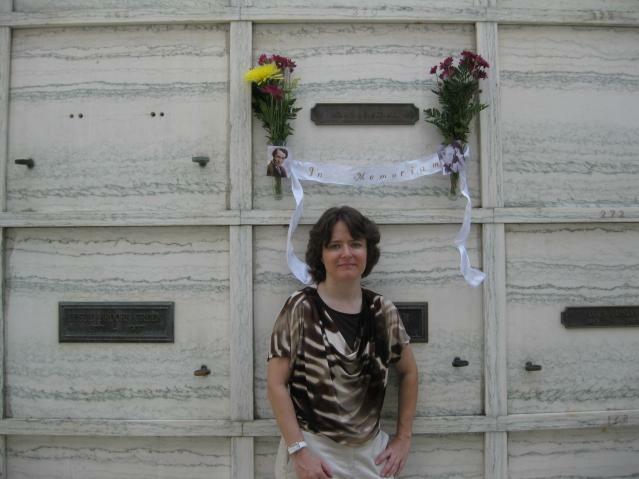 Me with Henry B. Walthall's Crypt. Finding no decoration on his crypt, I took the short walk to the gift shop to pick out a flower that was simple yet bold enough to catch the attention of a passerby. As I was leaving, I realized that the flower I placed was the only one in the entire wing which seemed to re-emphasize the lonely atmosphere. 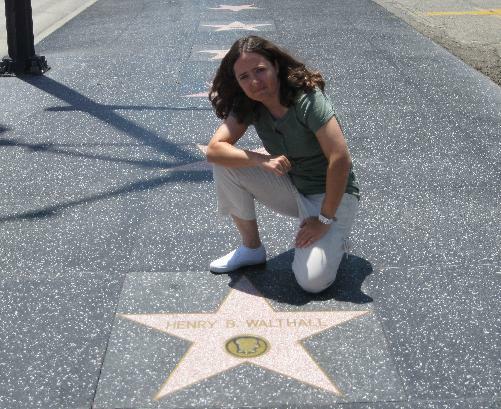 A humble gift of thanks for Henry B. Walthall. 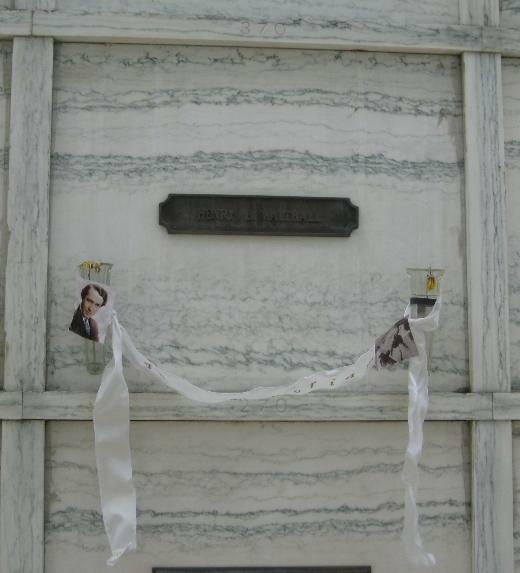 Of course, while I was there, I had to visit the main attraction of the cemetery--Rudolph Valentino's crypt in the Cathedral Mausoleum which is at the opposite end of the cemetery from the Abbey of the Psalms. When entering the mausoleum, the crypt is located in the second and last wing on the left side. Inside this wing to the right is another smaller wing with a stained glass window. Valentino is in the corner next to the window. 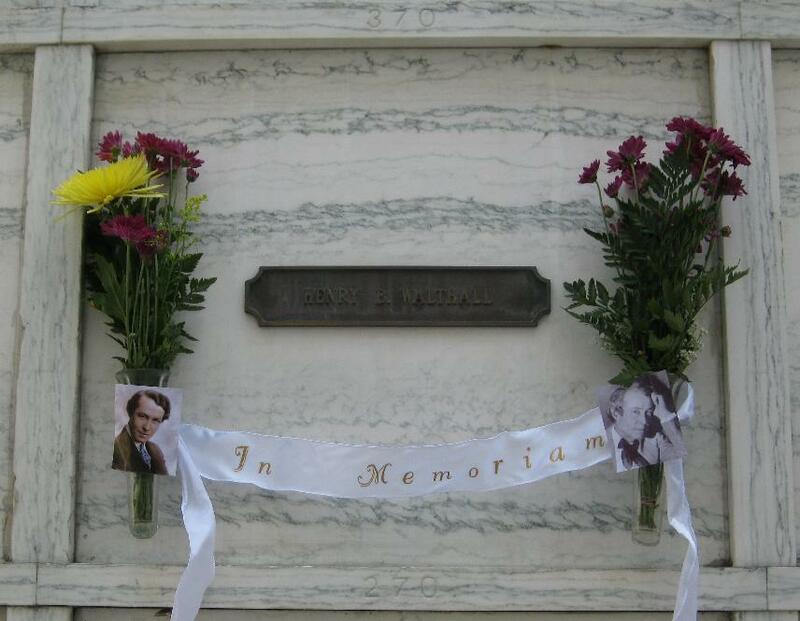 Memorial services have been held here to commemorate the anniversary of his death every year since he died in 1926. I've heard people comment on how uncharacteristically plain Valentino's plaque is. It is much more elaborate than Henry B. Walthall's. 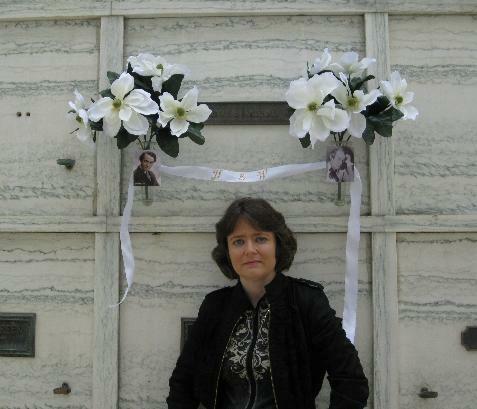 Me with the famous crypt of Rudolph Valentino. At first I had difficulty finding Henry's star. An address I found on the Internet was incorrect. The star is at 6201 Hollywood Blvd near the cross street of Vista Del Mar Ave. To its east is the star of Sam Warner (one of the "Warner Bros.") which is the last star before crossing the street. To its west is a blank star and, west of that, is one of the stars of Vincent Price. 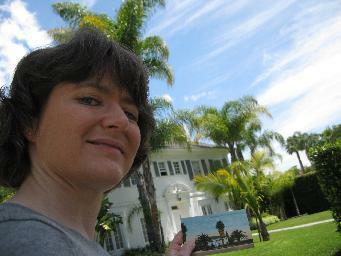 On the corner of Hollywood & Del Mar, just a few yards from Henry's star. As with Henry's crypt, there is a kind of loneliness about the location of the star. It is in front of a parking lot. 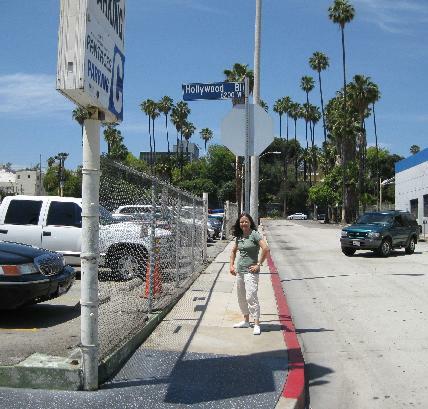 There did not seem to be near as much foot traffic as in the other parts of the Walk of Fame which proved advantageous when taking pictures. Also, as with his crypt, the star above his was blank. Hurry! Take the friggin' photo! The ground is HELLA HOT!!! Major construction is happening next to Walthall's star. No longer will there be a parking lot next to it. Huge buildings are going up and, as of now, a protective canopy is over Walthall's block on Hollywood Blvd. The Hollywood sign is no longer visible from the front entrance of Hollywood Forever cemetery because of this construction. I am hoping to see the brand new businesses in their finished or near finished form during my next visit. 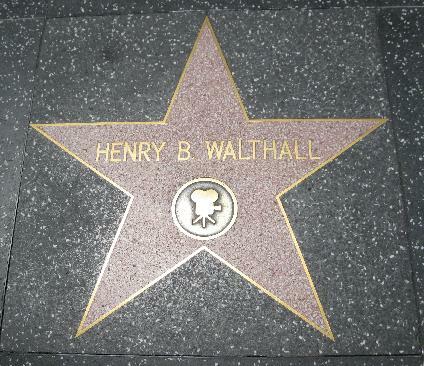 The area around Henry B. Walthall's star has come a long way from the parking lot I saw in 2009. 6201 Hollywood Blvd. is now the address of Eastown LA Apartments and Townhomes. It is a very impressive complex. At the spot of Walthall's star is Greenleaf Gourmet Chopshop. It was not open yet when I visited, but I will make it a point to eat there the next time I am in Hollywood, if the business is still there. 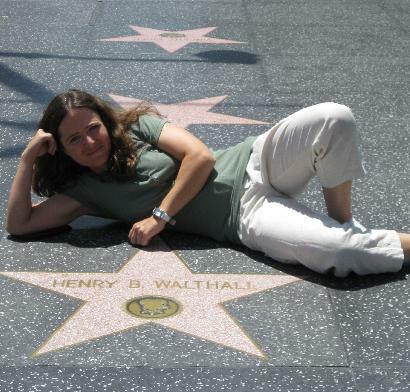 To be more specific regarding the location of Walthall's star, it is between the streets of Argyle and El Centro Avenues. After several phone calls, the nice folks at Hollywood Forever Cemetery assured me that Henry B. Walthall's missing vase holder was replaced. August 9, 2010, I returned to the site and, not only did I find the vase holder fixed, but two glass vases were placed inside. That was a pleasant surprise. Here are photos that show a new memorial I left behind. 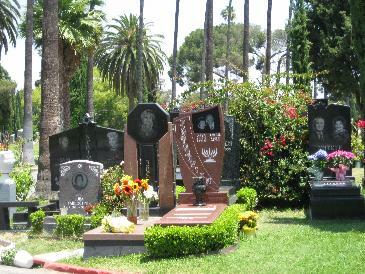 Returning to the cemetery about nine months after my last visit, I discovered that the folks at Hollywood Forever do not regulary remove decorations and dead flowers from crypts. I was very surprised to see the old, sagging ribbon I left previously. I guess there is something charming about that, though. 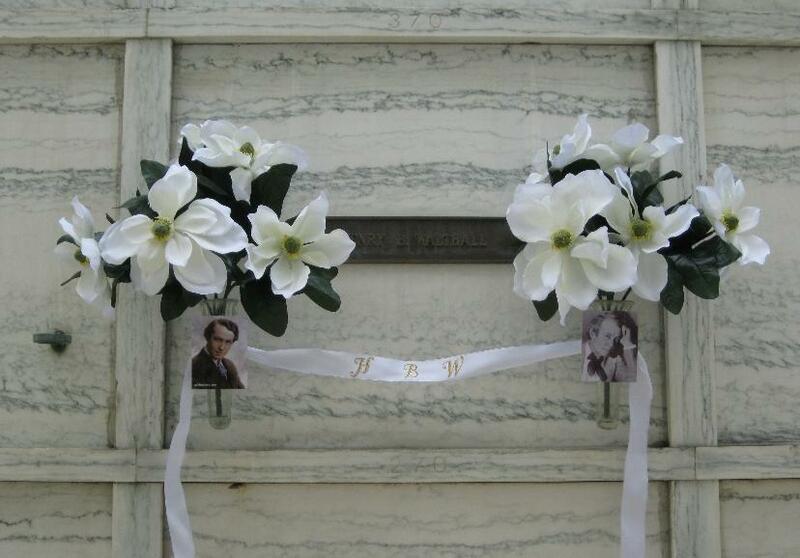 A fresh ribbon and artificial magnolias were left at the crypt which will, hopefully, look nicer after a year than the previous memorial. 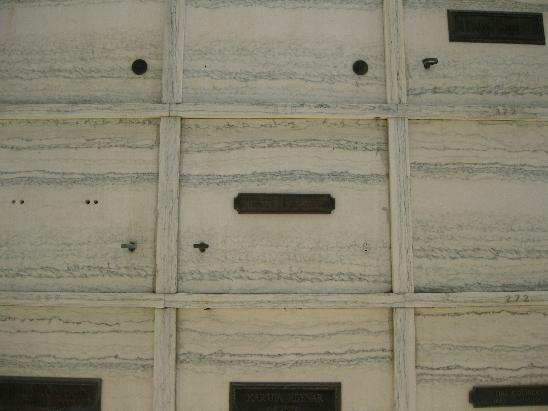 I also learned that the crypt to the left of Walthall's (from the perspective of looking at the crypt) with the holes for a plaque and vase holders is empty. A couple (of no relation to Walthall) was interred in that crypt but were moved in 1988. 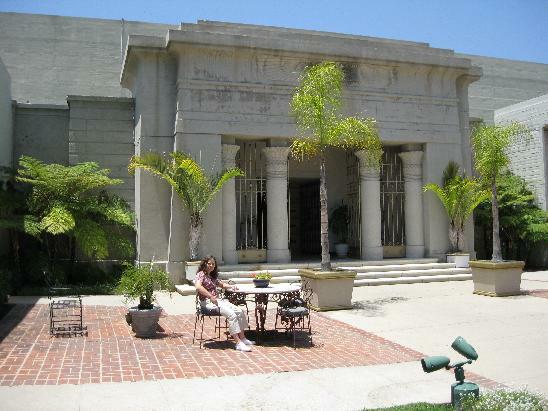 A lot of work is being done at the Hollywood Forever cemetery, including in Walthall's wing of the Abbey of the Pslams. 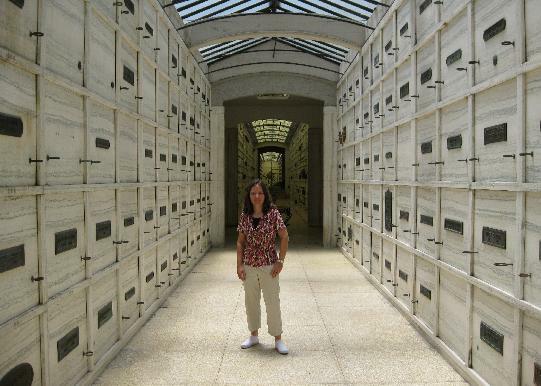 The last time I visited, I noticed that some of the crypts were breaking apart where you could almost peek inside. They are now being fixed and cracks throughout the wing are being patched. Some work needs to be done above Walthall's crypt where it looks like water leaks are causing some damage to the trim in addition to the normal wear and tear due to age. Considering the repair work already in progress, I believe this area will be fixed soon as well. Click play on the box below or click on the link for a little two-minute tour of the Abbey of the Psalms showing the route to Walthall's crypt. As you can see, the framed painting in the former entrance to the Sanctuary of Hope (pictured above) has fallen apart. There is a lot of construction being done around this mausoleum all the time as they keep expanding it which is the source for the noise heard at the 1:31 point. This video was filmed on May 17, 2011. I visited the mausoleum the next day and one of the glass ceiling panels on the other side of the wing (if you were to turn to the left at the entrance instead of right) had fallen through and another panel was barely hanging on. Caution cones and tape were placed underneath the hanging panel. This part of the mausoleum in very old and needs constant maintenance. 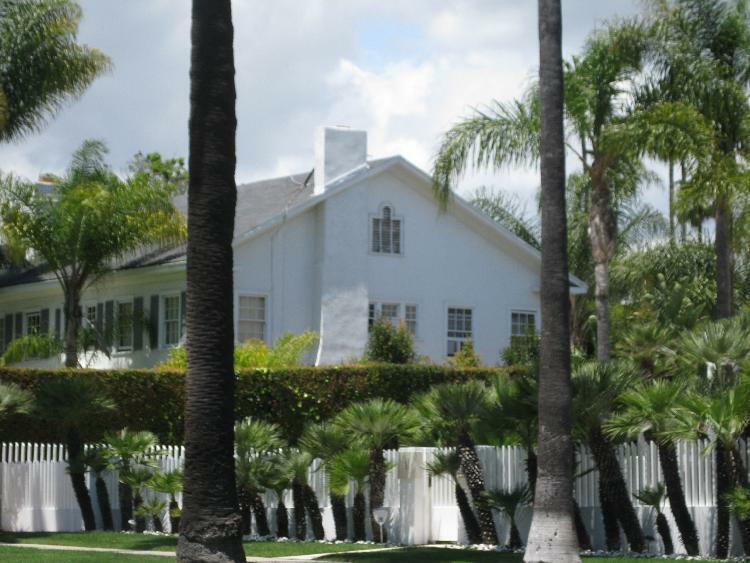 On May 18, 2011, I was able to check out the front exterior of Henry B. Walthall's former residence on North Beverly Drive in Beverly Hills and was happy to see that the house has not changed much through the decades. 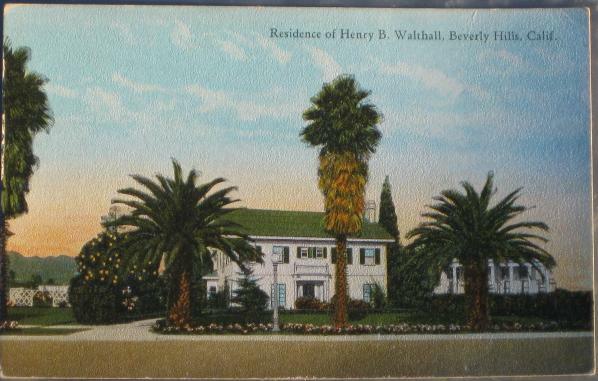 A postcard from the 1920s shows the house from the time Walthall lived there. 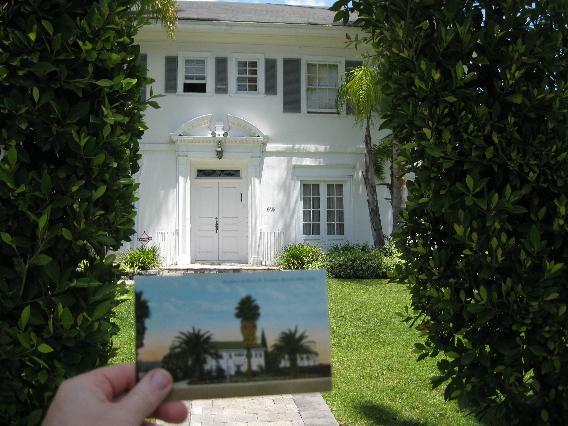 The roof and shutters, as depicted in the postcard, are green. Now they are a grey/blue. One of the shutters on the far right (from the perspective of looking at the house) has broken panels. A second chimney on the left may have been added as there doesn't appear to be one in the postcard although a tree is obscuring the view. A lot has been changed to the lanscape in front of the house, though. 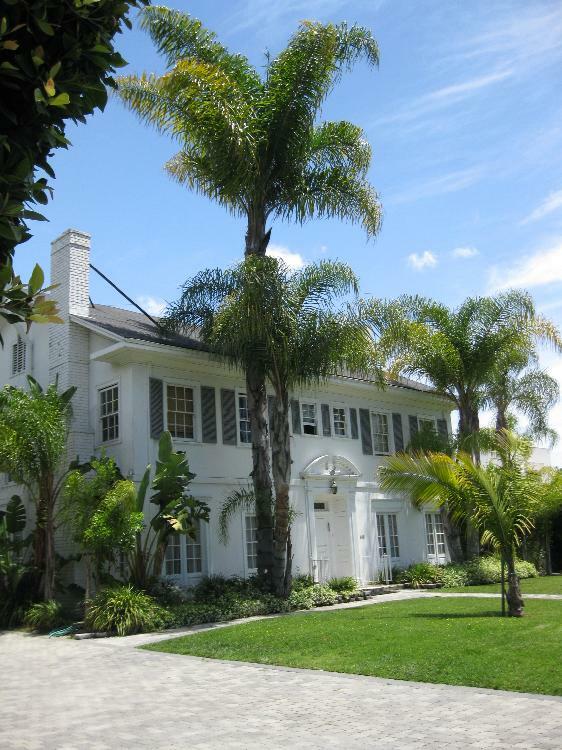 A string of very tall bushes and a lopsided entry arch now surrounds the front of the house. The bushes were probably added within the last several years as someone's Blog, which is no longer up, showed a photo of the house, which looked to be taken fairly recently, that did not have any front bushes. An entrance from the front door to the sidewalk was added and a building, which appears to be a garage with a gate, was built to the left of the house. The windows and shutters look like they are the originals although the front door and trim has been modified. I had to be a bit circumspect in taking the photos for obvious reasons. I won't give the exact address in the fear of angering the current residents although the address is available elsewhere on the Internet. The house is in a very affluent neighborhood as would be expected. An overhead view on Google Earth reveals a swimming pool AND tennis court behind the house. In fact, most of the houses in this neighborhood have tennis courts. According to Zillow, a Real Estate website, the house was built in 1916. I do not know if Walthall had the house built as, around that time, he had signed with the Chicago-based Essanay film company and may have moved to the Windy City. The single family home is 3,554 square feet with four bedrooms and four bathrooms. It is on a 0.83 acre lot. Many modernizations have been done to the interior with the "original character & integrity maintained: crown moldings, hardwood floors, doors & hardware, bar w/gleaming wood walls." Its estimated value is $4,197,000. 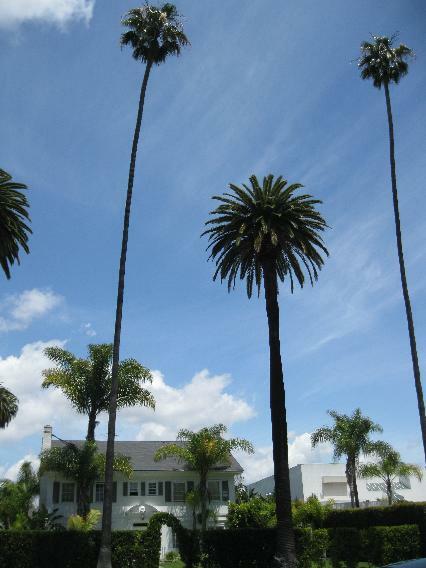 In November 2010, it was listed for sale for $6,626,000!